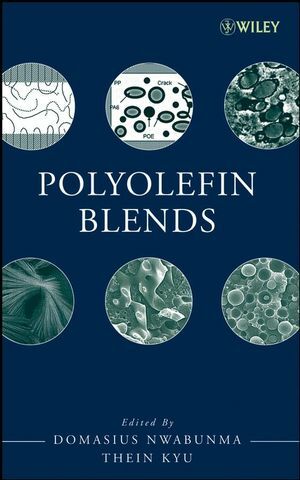 With chapters contributed by leading experts from several countries, this is a must-have reference for scientists and engineers conducting research on polyolefin blends and for professionals in medical, packaging, and other commodity fields. It is also an excellent text for graduate students studying polymer science and polymer processing. Domasius Nwabunma is a research specialist at 3M with expertise in polymer processing. He holds three patents, has authored numerous well-cited journal papers, and has been a speaker at various conferences. He is a senior member of the Society of Plastics Engineers (SPE) and a member of the American Chemical Society (ACS) and the Polymer Processing Society (PPS). He has received many awards and honors and has held many leadership positions. His most recent leadership post was as President of the Upper Midwest (S22) Section of the Society of Plastics Engineers. THEIN KYU is a Distinguished Professor in the Department of Polymer Engineering at the University of Akron. He has written 180 refereed papers and book chapters, holds four patents, and coedited Liquid-Crystalline Polymer Systems, an ACS symposium book. 1. Overview of Polyolefin Blends (Domasius Nwabunma). 2. Miscibility and Characteristics of Polyolefin Blends (James L. White and Jinhai Yang). 3. Miscibility, Morphology and Properties of Polyethylene Blends (Robert A. Shanks). 4. Miscibility and Crystallization of Binary Polyethylene Blends (Moonhor Ree). 5. Microscopically Viewed Structural Characteristics of Polyethylene Blends between Deuterated and Hydrogenous Species: Cocrystallization and Phase Separation (Kohji Tashiro). 6. Thermal and Structural Characterization of Binary and Ternary Blends based on Isotactic Polypropylene, Isotactic Poly (1-Butene) and Hydrogenated Oligo (Cyclopentadiene) (Maurizio Canetti). 7. Morphological Phase Diagrams of Blends of Polypropylene Isomers and Poly(ethylene octene) Copolymer (Wirunya Keawwattana, Rushikesh Matkar, and Thein Kyu). 8. Structure, Morphology and Mechanical Properties of Polyolefin Based Elastomers (Shigeyuki Toki and Benjamin S. Hsiao). 9. Morphology and Mechanical Properties in iPP/Polyolefin-Based Copolymer Blends (Koh-Hei Nitta and Masayuki Yamaguchi). 10. Functionalization of Olefinic Polymer and Copolymer Blends in the Melt (Boleslaw Jurkowski, Stepan Stepanovich Pesetskii, and Yuri Mikhailovich Krivoguz). 11. Deformation Behavior of ß-Crystalline Phase Polypropylene and its Rubber Modified Blends (Sie Chin Tjong). 12. Multiphase Polypropylene Copolymer Blends (Francis M. Mirabella). 13. Heterogeneous Materials Based on Polypropylene (Jesús Maria García Martínez, Susana Areso Capdep¢n, Jes£s Taranco González, and Emilia Pérez Collar). 14. Polypropylene/Ethylene-Propylene-Diene Terpolymer Blends (Chang-Sik Ha, Subhendu Ray Chowdhury, Gue-Hyun Kim, and Il Kim). 15. Ethylene Propylene Diene Rubber/Natural Rubber Blends (Soney C. George and Sabu Thomas). 16. Phase Field Approach to Thermodynamics and Dynamics of Phase Separation and Crystallization of Polypropylene Isomers and Ethylene Propylene Diene Terpolymer Blends (Rushikesh Matkar and Thein Kyu). 17. Compatibilization and Crystallization of Blends of Polyolefins with a Semiflexible Liquid Crystalline Polymer (Liliya Minkova). 18. Functionalized Polyolefins and Aliphatic Polyamide Blends: Interphase Interactions, Rheology and High Elastic Properties of Melts (Boleslaw Jurkowski and Stepan Stepanovich Pesetskii). 19. Plastic Deformation and Damage Mechanisms of Ternary PP/PA6/POE Polymer Blends (Shu-Lin Bai, Christian G?Sell, Gongtao Wang, Jean-Marie Hiver, and Min Wang). 20. Reactive Compatibilization of Binary and Ternary Blends Based on PE, PP and PS (M¢nica F. D¡az, Silvia Barbosa, and Numa J. Capiati). 21. Polyolefin/Epoxy Resin Blends (Bejoy Francis and Sabu Thomas).